Lord Murugan is the main deity at the Clairwood Shree Siva Subramaniam temple. He is the second son of Lord Siva and Parvathi and youngest brother of Lord Ganesha. He is the Lord of righteousness, who protects dharma by destroying evil. Murugan in Tamil means un-decaying beauty and ever lasting youth. Lord Murugan is known as Skanda, Subramanya, Shanmuga and Karthikeya. Lord Murugan is the most popular God amongst Tamils. He has two consorts, Valli (symbolizing desire) and Deivayanai (symbolizing power of action). Subrahmanya married Valli according to the Gandharva mode. He did not obtain the permission of her parents for doing so. That also shows that Valli is His desire-force. On the other hand, his marriage of Deivayanai was after his victory over the Asuras. Out of gratitude, Indra gave Subrahmanya his own daughter Deivayanai in marriage. This was done according to Vedic rites. These events point to the fact that Deivayanai is His action-force. 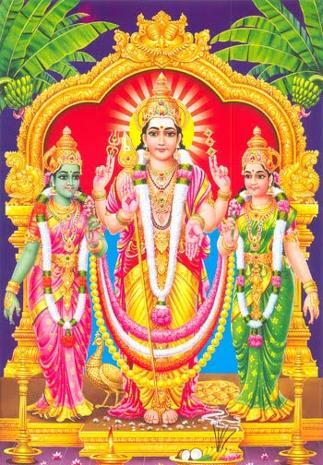 The two wives Deivayanai and Valli also symbolise the two types of devotees among those who strive for Moksha or Liberation through union or oneness with the Supreme. One type consists of those who rigidly and sincerely observe the injunctions and follow the teachings of the Vedic scriptures and are thus the followers of Vaidik Karmas. That type is represented by Deivayanai, whom Subrahmanya married in the regular orthodox way. The other type consists of the ardent Bhaktas who attach more importance to right mental feeling and emotion than to rules and regulations. This type is symbolised by Valli, who grows as the foster-daughter of the hunter-king Nambi. Subrahmanya marries her in the combined Gandharva and Paisacha modes of marriage. He manifests love in wooing her and uses force in fighting against her relations who try to obstruct him. In the pictures, Lord Subrahmanya holds the Vel or Spear in his hand, just as Lord Shiva holds the Trident or Trisula. This is an emblem of power and indicates that he is the ruler of this universe. The devotees of Lord Subrahmanya do obeisance to the Vel. The Vel or Spear was given to Subrahmanya by Parvati, the embodiment of Shiva-Shakti. It, therefore, indicates that the Vel was the symbol of true knowledge as coming out of Parvati, the Para Shakti. The shape of the Vel also shows that Knowledge in the form of Jyotis will start from Muladhara, which is the bottom of the Vel, pass through the intermediate Nadis (which are represented by the body of the Vel), and pierce through the thousand-petalled Brahmarandhra, which is represented by the sharp, leaf-shaped end of the Vel. The Vel is the weapon which pierces through the demon of ignorance. This is Ekagra Chitta or the one-pointed mind so much insisted upon in Raja Yoga without which progress is impossible for the Yogi. It is the preliminary for concentration, meditation and absorption—all of which together constitute the Yogic Samyama. In the legend, it is Soorapadma, the Asura, who is slain by the Vel. That Asura is none other than ignorance. The Vel has the three attributes of wisdom with its deep stem representing a deep understanding, the breadth of the blade representing wide knowledge and its sharpness representing a sharp intellect. Shanmukha’s Vahana, the peacock, shows the shape of the Pranava letter OM. It is the shape of the Bindu. When the peacock has spread out its tail, it has the round shape of the Pranava. Within it is the Parabrahma Jyoti which is the form of Muruga or Subrahmanya. The subordinated serpent kept in check by the peacock’s feet shows the Maya impurity completely overpowered by the power of Pranava. The peacock is the most beautiful of all birds. It is the one bird which can reveal its inner joy by dancing and displaying its gorgeous plumage. When it does so, it evidences its perfect balance, for it is a very heavy bird and it has to keep its balance on its two very slender feet. Thus we can also interpret the peacock as symbolising mental equipoise, the predominance of the Sattva over the Rajas and Tamas qualities. Such a mental condition reveals itself in a superior sort of self-satisfaction, a state similar to that of the peacock which spreads out its beautiful plumage. It is this predominating Sattva that is the pre-requisite for the acquisition of True Knowledge, the Knowledge symbolised by Lord Subrahmanya Himself. The Vahana (peacock) is also by way of representation that the Lord has entirely conquered pride, egoism, vanity. The cobra under His Feet is to indicate that He is absolutely fearless, immortal and wise.